In the summer of 1980, the Vidya­dhara, Chögyam Trungpa Rinpoche, invited my father and me for dinner at the Kalapa Court in Boulder, Col­orado. That evening, Rinpoche sur­prised me with an extraordinary gift: a collection of his seminary transcripts along with a roll of Japanese brocade personally designed by him, on a tray. The Vidyadhara looked at me over the rim of his glasses and asked, “Can you read in English?” “Not very well,” I replied. “Perhaps someday you can enjoy these,” he said, motioning to the stack of transcripts. While I was attending monastic college, I kept Rinpoche’s transcripts with me and never forgot his words. After attending Columbia University, I began to read them more closely. Rinpoche’s fresh and experiential interpretations of the orig­inal Buddhist concepts that I’d studied my whole life couldn’t help but give me a new perspective. Three decades after receiving the transcripts, I appreciate the opportunity to revisit these his­toric and innovative teachings. Once again, I’m struck by the remarkable achievement of the Vidyadhara and his brilliant and masterful pre­sentation of buddhadharma to the West. At the same time, it’s a challenge to convey their special qualities and what they’ve meant and continue to mean to those seeking a genuine experience of waking up. As a member of the last generation of Tibetan masters trained in Tibet, Chögyam Trungpa Rinpoche received a rigorous, and I daresay excruciatingly thorough, training in the Vajrayana tradition of Buddhism before fleeing to India. Through his studies at Oxford University and years of living in the U.S., he developed a command of the English language, as well as an intimate knowledge of Western culture and the contemporary cosmopolitan psyche. 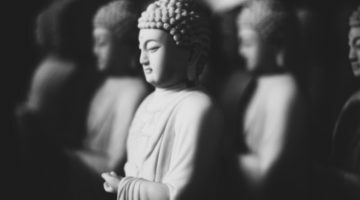 Coupled with his classic Buddhist train­ing, these experiences laid the ground for a fascinating and unique presentation of the Buddhist teachings, one that left none of the most essential pith instructions behind. In many cases, in order to connect with Western mind and experience, he redefined and reshaped terminologies to give fresh connotations to existing English words, such as ego, boredom, and basic goodness. A number of Buddhist phrases commonly used today were coined by Rinpoche. He used the terms spiritual materialism and spiritual narcissism to describe a tendency of many practitioners to turn their spiritual jour­ney into an ego­enriching exercise. He dubbed as idiot com­passion the tendency to give people what they want, instead of what they really need, because one can’t bear their suffering. Such innovations, rare in traditional settings, signaled the very beginnings of a truly Western Buddhism. The concept of spiritual materialism, especially, has become ingrained in the lexicon of Buddhist practice communities in the West. This term brilliantly demonstrates not only the Vidyadhara’s powerful understanding of the difficulties and struggles of the path at hand but also a savvy grasp of West­ern psychology. His intimacy with Western culture allowed him to take an idea like “materialism,” already familiar to his students, and apply it to the Buddhist path in a practical way. Not the philosophical position of materialism, mind you, but the habit of going to the mall—that perpetual pressure of consumerism built on the assumption that the acquisition of more and more things will somehow lead to contentment. 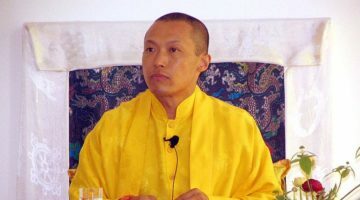 It was Rinpoche’s rapport with the Western experience that allowed him to make the connection between our ordi­nary materialistic desires and impulses and the more subtle, deep­seated grasping that reinforces ego­fixation and derails our spiritual path. This was Rinpoche’s idiosyncratic ground­breaking kindness and genuine innovation: buddhadharma skillfully delivered and packaged for the first time for a West­ern audience. In addition to transplanting genuine buddhadharma in the West, in the late 1970s Trungpa Rinpoche also shared his long­held vision of enlightened society with the world through the cycle of teachings known as Shambhala Training. A series of contemplative workshops and meditations in secular form, Shambhala Training provided lay practitioners with a progres­sion of skillful means to connect with their “basic goodness” and contribute to the development of a fearless, gentle, and sane society. With the publication of The Profound Treasury of the Ocean of Dharma, the same seminary transcripts that I first set eyes on more than thirty years ago have taken birth as three user­friendly volumes, beautifully arranged and elegantly edited without losing the author’s intention or voice. The vol­umes offer a glimpse of the heart teachings of the Vidyadhara, given to his students over several years with his uniquely pro­vocative and meticulous style, enhanced by his knowledge of Western epistemology and psychology. Volume one covers the classical Buddhist teachings of the yana of individual liberation, volume two the Mahayana, and volume three the Vajrayana. There are some misunderstandings surrounding whether or not Vajrayana practitioners even need to engage in the other yanas. But according to some of the major Buddhist tantras, like the Hevajra and Kalachakra tantras, the development of the view, meditation, and action of the entire three­-yana jour­ney is without a doubt essential and necessary. In this compila­tion of his seminary teachings, Chögyam Trungpa Rinpoche is in complete sync with tantric tradition. When engaging in any spiritual practice, Trungpa explains, “You need to have a basic understanding of where you are starting from, where you are going, and what you are working with.” Starting with “what you are and why you are search­ing” is the correct way to begin. When you try to cling to space, to grasp it, the whole perspective is completely changed. You have solidified space and made it tangible. That sense of self­consciousness is the birth of duality… There is still primeval intelligence, or vidya, but it has been captured and solidified. Therefore, it has become avidya, or ignorance. That blackout of intelligence is the source of the ego. Trungpa describes the ego that we discover in the process of solidifying the space as “a brilliant work of art.” According to Buddhism, ego is merely a label given to the collection of the skandhas experienced as “I” or “me.” Trungpa felt that this process—how the ego­label unifies this “disorganized and scattered process into one entity”—was rather clever. How do we cut through this seeming “ape instinct of habit­ual struggle” and find liberation from ego­fixation? Trungpa answers, “Everyone possesses ultimate wakefulness,” which is not a product of our effort. He says, “The only effort needed is to give up that struggle.” Only then is liberation—gentle and delightful—realized. After presenting us with a panoramic view of the principles of the Buddhist path, Trungpa guides us step­-by­-step through a precise, in-­depth journey through the path of individual liberation, starting with shamatha meditation and the practice of mindfulness, then moving through the more analytical teachings of the four noble truths and twelve links of dependent origination (nidanas), and on to other classical Buddhist concepts, such as the six realms of existence, presenting them as six psychological states. Going further on the Buddhist path by taking refuge in the Buddha, dharma, and sangha is itself another way of letting go of theism. It’s an acknowledgement of an undertaking, an expression of personal responsibility, not dependence. As Trungpa explains, “Buddha’s statement that you have to be intelligent about what you are doing and about your com­mitment to spirituality automatically brings up the notion of nontheism.” While the spiritual goal of theism seems to be reaching the highest possibility of the world’s loftiest ideals, such as becoming godly or reuniting with a supreme deity, the approach of nontheism is simply trying to relate with ourselves. There’s not a lot of distance to travel. It’s based totally on personal experience geared toward fully realizing egolessness. In accord with the three­-yana approach, Trungpa presents the main body of the practice of the path of individual liberation with the triad of shila, samadhi, and prajna. Meditation practice is not only about developing your powers of concentration. It’s also about developing sympa­thy for yourself. You can finally enjoy being you, Trungpa explains, without having “to borrow anything or bring any foreign influences into your life.” The only thing you need is the genuine experience of your own mind. Shamatha alone isn’t sufficient to cut through ego, how­ever. It needs to be joined with vipashyana—higher aware­ness, or superior seeing. It’s the insight that comes from direct meditative experience or contemplative analysis. In Tibetan Buddhism, this is vipashyana meditation on emptiness, which brings about the realization of egolessness. Once our mind is processed by shamatha, discriminating awareness, or prajna, begins to arise. Also known as tran­scendent knowledge, prajna becomes the quintessential ele­ment of practice that directly cuts through ego. Without the understanding of egolessness, there is no Buddhist path and there is no cessation of suffering, or nirvana. Once you have refined the perfect body of shila, samadhi, and prajna of the path of individual liberation, then the Mahayana outfit of bodhichitta, the mind of awakening, will fit well and look good. “The question is, what are you waking from?” asks Trungpa. “You are waking from the three poisons: passion, aggression, and ignorance or delusion.” There’s a simple pro­gression. First, through the application of loving­kindness and compassion, your heart starts to awaken, which means being gentle with and respecting yourself. Then you begin to develop a particular kind of heart—the enlightened heart of wisdom and compassion, intellect and insight. The more we tame our mind, the more our inquisitiveness increases. “At that point, the possibility of further learning is taking place,” says Trungpa. The Mahayana teachings point out that our fundamental nature is tathagatagarbha, bud­dhanature, or what Trungpa calls the “enlightened gene.” Whether we see it or not, Trungpa explains, this deeper nature manifests all the time in “some kind of gap, some discrep­ancy in our state of being that allows basic sanity to shine through.” Even though such potential may appear to be hid­den or stained, the stains can be removed since they are not part of the true nature. Such buddhanature is said to have two aspects: stained and unstained. Hence, the practice here is to eliminate the conditioned stains and realize the unconditional state of tathagatagarbha. In order to discover and nourish this precious awakened heart, we engage in the skillful practices of the Mahayana. Therefore, in the second volume, Trungpa guides his students through the Mahayana principles of relative and absolute bodhichitta, focusing on those practices well known for their power to cultivate experiences of emptiness and compassion: making commitments to the bodhisattva way; engaging in the practices of the six paramitas and the seven points of mind training; and applying ourselves to the study of the profound view, meditation, and conduct of the five paths and ten bhumis. The whole journey we take here is designed to bring us back to our original state, the open space of “primeval intelligence”—also known as the state of buddhahood. Avidya, or ignorance, is transformed back into vidya, pristine intelligence, through the general Mahayana notions of benevo­lence and insight into egolessness. This is not neces­sarily a swift or direct path to awakening but rather a long journey to full enlightenment. A key difference between the Mahayana and the Vajrayana, Trungpa explains, is that “the Vajrayana teachings understand that even relative truth is workable and insightful. On the level of relative truth, all dharmas are seen as equally important and in equilibrium.” The relative truth is “not regarded as a pick-­and­-choose situation; rather everything taking place there is regarded as the real world,” says Trungpa. Sacred outlook, or “the awareness that all phenomena are sacred,” is the understanding that “stems from the experience of mindfulness­-awareness practice, or shamatha­vipashyana.” The idea of sacredness, says Trungpa, is not based on a popu­lar “theistic view of sacredness,” a sense of being “blessed or influenced by external holiness.” Sacredness here is self­-existing, originally pure and free. In the Vajrayana, we learn how to respect our world. We realize that this particular world we live in is not an evil world, but a sacred world. It is filled with sacredness alto­gether. We learn to develop sacred outlook. As we develop still further, we receive transmission. And from that, we develop a sense of how we could actually perceive phenom­ena without trying to perceive. We realize how we could appreciate phenomena instantly, without a struggle. …distrust means condemning the whole thing, whereas doubt is knowing that there are possibilities. Doubt is knowing that something is happening, but not knowing exactly what is going on. It provides you with the possibility of questioning yourself as to whether you have the faculties and capability to understand the Vajrayana. If you are treading on this path, it is very important for you as a student that you and your vajra master come to a mutual conclusion. You have to reach a mutual understand­ing with each other that you actually have to demolish the hidden corners of samsara. You have to demolish the devas­tating tricks that exist and that you have been able to main­tain for such a long time. 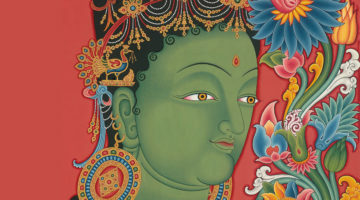 The abhisheka process is connected to the Vajrayana con­cept of the samaya principle: the commitment and vow to safeguard the integrity of the teachings. Fundamentally, this “basic commitment is to yourself. 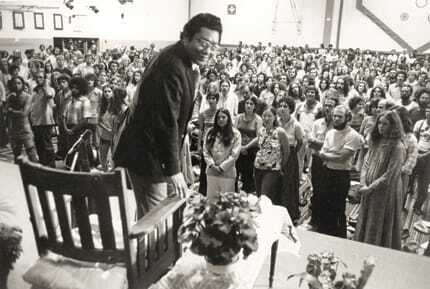 Beyond that, your commit­ment to others and to your teacher will arise naturally,” says Trungpa. However, samaya should not be taken simply as a vow or command. It’s a meaningful way of binding “the teach­ing, the teacher, and the students together in one particular project.” In this way, we come to trust in our own vajra heart, the absolute nature of our own mind. There are lots of misunderstandings regarding the Vajrayana guru in the Buddhist world today. However, if we look with the eyes of unbiased wisdom, a similar principle exists in all three yanas—that is, the concept of a master holding the upadesha, or key instructions. It’s important to understand that there are different levels of teachers who support and guide us appropriately on our journey through the yanas. According to Trungpa’s explanation of these levels, in the path of individual liberation, the “teacher acts as kind of a parental principle” and is somewhat like an instructor or a schoolteacher; whereas in the Mahayana, the teacher is known as kalyanamitra, or “spiritual friend,” which is “more than a schoolteacher. The Mahayana teacher is a like a physician and friend at the same time,” says Trungpa. He or she is concerned with your spiri­tual development and well­being. Finally, in the Vajrayana, the teacher is called “vajra mas­ter,” or guru. This level of teacher works much more directly with students and has a keen unflinching interest in their prob­lems and buddha potential. Consequently, the search for pro­found instructions, profound wisdom, or profound methods of awakening is most fruitful with the guru. Normally, the guru refers to someone who holds an enlight­ened lineage that is passed down unbroken from genera­tion to generation. Such a person need not be prominent or acclaimed. The guru in the Vajrayana, however, isn’t neces­sarily an individual; there’s also the principle of guru, which operates at this level. I believe that the guru is simply like a mirror that reflects the true nature of our own mind, our buddha mind. But in order to see this reflection, we have to have some light. We can’t be standing in a dark room. That light is our sense of devotion to our guru. Without turning on this light, there’s no way we can truly see all the features and qualities of our reflection. The method of deity yoga, or yidam meditation, is a key element of Vajrayana practice. The yidam deities are “personi­fications of your particular nature” and are connected with the notion of the five buddha families—each symbolizing par­ticular neuroses and skillfully connecting to their transmuted nature of enlightened wisdoms. The yidam that you identify with is based on your own experience because, Trungpa says, “it is an imagination of your mind.” The only way to take part in the skillful practices of yidam meditation is through receiving abhisheka and oral instructions. In order to embark on the Vajrayana path fully, we must understand and engage in the practices known as the four aspects of tantra or those of the nine­yana journey. Hereafter, Trungpa Rinpoche precisely and in detail presents the four tantras and the Mahamudra teachings on the nature of mind in the context of the nine yanas of the Dzogchen system. In the Vajrayana, we say all rivers eventually flow into the ocean, and in the same way, all the practices of the three yanas lead to the ninth yana, atiyoga or maha ati. This yana is also renowned as the ultimate vehicle, or “the yana of complete transcendence,” belonging to what’s known as Mahasandhi, or Dzogchen, the great completion. on their own, very simply. Maha ati is ultimate or final. At the same time, says Trungpa, it’s important to know that “the practitioner of maha ati has already accomplished a great deal by going through the earlier yanas.” For this reason, the whole nine­yana journey becomes indispensable for those who seek true freedom and genuine awakening. The journey of awakening here is our primeval intelligence, or vidya, leaping into the open space at the beginning. When we become the space and awareness, or the primeval intel­ligence, then awakening is right there with you. The Shambhala teachings are founded on the premise that there is basic human wisdom that can help to solve the world’s problems. The wisdom does not belong to any one culture or religion, nor does it come from the West or the East. Rather, it is a tradition of human warriorship that has existed in many cultures at many times throughout history. In these three volumes, the wisdom of Trungpa Rinpoche shines like “the great eastern sun.” The Profound Treasury of the Ocean of Dharma is truly a precious resource for all Buddhist practitioners and for those willing to explore and learn the complete teachings of the Buddha. This is Chögyam Trungpa Rinpoche’s banquet for lovers of the spiritual path in this twenty­first century—and a great gift to the development of Western Buddhism.